Toronto Blue Jays pitcher Brett Cecil. STRADER: Brett going down means Brian Burke needs to chase Rick Nash? No, I don’t think the big forward from Brampton can snap off a slider, but there was one thing on my mind after I saw the news that our 15-game winner from 2010 is going back to AA. Please god don’t let this become a theme! Sports writers have a duty. We can’t be homers. We have to look evenly at every situation and report on it how it is, not how we think it is, how we think it might be. Look like you’re favouring a team, coddling a favourite player, and what are you for your reader? Here’s me doing a little Jays apologizing. But don’t fret, this is not homerism, this is a balanced and well thought out preemptive strike. That’s for all the vultures circling the Jays rotation right now. For as many sports writers that look at the depth of talent the Jays have put together and see the light at the end of the tunnel, there will be those, call them the sheen on the glass walls of the fishbowl, that will circle a failure like vultures. 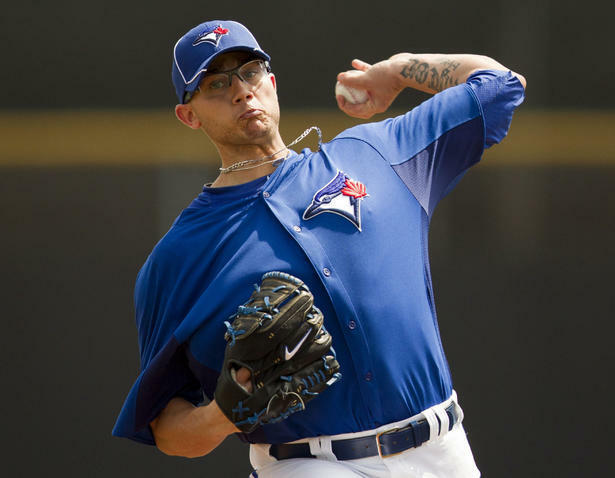 Has Brett Cecil regressed? Absolutely. Is there an organizational concern with what once looked like a can’t miss prospect? But does this mean that if Dustin McGowan experiences a set back, if Henderson Alvarez comes back from (??? Superman’s home planet), that we need to see a million stories from a dozen or so sports geniuses who will go back and forth about whether 75 wins is a failure and the starting rotation is the reason, and they should have seen this coming….veteran starter….been saying it all year….Blah blah blah. I’m certainly not saying don’t pick on the players. I’m not that guy. I’ll heckle with the best of them. That’s the glory of professional sports. But is a 75 win season by the 2012 Jays, if it happens, a failure? Brett can go down. He’s not ready, and maybe won’t be able to get it back. Alzarez can struggle, he’s 22!! Lawrie can bat .260, with maybe 15 homers, and learn more about his position and being a professional, these would all be normal. But with the amount of hype surrounding the Jays (Oh man, American writers are picking them for the playoffs, this is all we need…) there are those on the hunt for the pin, and as soon as they find it, they will jam it in the balloon. Cecil is going down, McGowan’s got a bad foot, the vultures are in the air. Let me say it here first. The Jays don’t need to make the playoffs. If they do, it’s icing on the cake, enjoy it as such. But cake is still awesome. Progression of the kids, growth of the minor league prospects, how is Anthony Gose doing with more major league type off speed pitching? What is Henderson Alvarez working on, a change up that he can throw away from left handers? A slider? A curve? What are the weaknesses in Brett Lawrie’s swing? What are the holes, and how can he correct them? How has Dustin McGowan changed as a pitcher now that he’s pitching again? Does he do anything differently on the mound, behind the scenes? Why Eric Thames over Travis Snider? Can people stop guessing, analyze their motions in the batters box, write a comprehensive piece about their differences and talk to some scouts about what makes one better than the other? Is Thames being showcased while Travis gets work in? The real wave of talent is coming in Jake Marisnick, Anthony Gose, Noah Syndegard, Drew Hutchison and others. Can we read more in depth pieces about what they bring to the table, or do I just get to read that Gose is fast until I see him with my own eyes? I’ll reiterate, I’m not saying don’t pick on the team. Look at the match ups for the first week. Romero vs. Masterson, Morrow vs. Jimenez, Carreno vs. Tomlin (?? – or whatever Carmona is called maybe? ), and then we have Alvarez and Drabek facing the Red Sox, and for as many chicken jokes as people want to make, they’re a powerhouse. I’m a Jays fan, but if they falter, I don’t mind pointing out why. I just don’t want to read the same thing all summer. Our rotation is Romero, Morrow, Alvarez, Drabek and McGowan, with Hutchison, McGuire, Jenkins, Carreno (probably a future reliever) and loads more of live arms waiting, and hunting, for their own spot. Is our rotation a question mark right now? Yes. But is that a problem? No, it actually isn’t. Please, can we read stories about baseball and not what baseball geniuses you all are for pointing out something that was obvious at the beginning of the season. This team is young, the rotation is young. If the season falls apart, I would still take the same rotation into next year with a smile on my face. So let’s read about what they’re working on, what’s happening on the field, and why. Not a bunch of easy stories about how a young rotation is going through the problems of a young rotation. Let Burke go pick up Nash, and halfway through the summer, we’ll leave the same old to the Leafs reporters, okay?